Wow I have a stalker LOL. Wow I can't believe no one has posted to you yet. I'm sorry I'm so late. Miami is not a good place to come if you have no experience or if you want to move to a new feild within nursing. This place is as dried up as a dead fish in the middle of a salt filled desert. I hope you have not already moved. The starting salary used to be $22.50/hr in 2006 by 2009 it was down to $19.00 now an RN with a BSN may find themselves being offered $16.25/hr. Stay out of Miami. Idiots here love to say that, "it's not what you know it's who you know" and everybody knows that that is not the full story. Miami is just dried up and no one wants to admit it. Legal issue about RN's and start of care for OASIS. The person did make reports to AHCA and the attourney general of the state. If an RN does an Oasis Start of care for a client and a shady agency says they will send an LPN out to do follow up but the care is never given is the RN's liscesne at stake? Given the RN has worked for the HH agency for 2 weeks and it's a first ever job. How does the RN protect him/herself? Battery of a nurse in the workplace... no one will tell the truth. I went to work for a home health care agency not long ago. To make a long story short I feel that they may be guilty of fraud on a great number of levels and since it is a company with so few "salaried" employees what happened to me was lied about even amongst witnesses of what happened. The HH nurses who do work for the company are being underpaid wages because their hours get "lost" and they are promised it will come in the next biweekly check but it never does. I was told by the DON who was also the owner of the company that I was to be reimbersed for a few items. When I went to the main facility I asked for my personell file to make a copy of the item I had paid for I saw a forged doctors not with my name certifying that I had had some sort of exam which I have never submitted nor did i sign, but a "doctor" had signed the form saying that I had been seen. When I demanded a copy of my personell file in full due to the fake form I was grabbed violently by the arm by a male staff member and the folder was taken from me by force. The two other female employees said that he never touched me but instead that I had been yelling and swearing at him. I went to show the red marks where he had grabbed me to another RN who worked there and I was told to call the police. I began to cry and felt violated. I could not complete the phone call. The DON fired the RN who told me to report to the police what had happened to me, when she got back to the office. No one in that office who saw that he grabbed me is telling the truth about the incedent because this small company works on lies and fraud to stay alive. Does anyone know what I should do. The other RN already reported the home health company to AHCA. Please help I'm just in too deep. No one wants to hire new grads!!! No I'm an RN/BSN with bls acls and pals under my belt to boot. They still say I'm under qualified at all of the hospitals and the LTC and hospice and home health just isn't taking anyone w/o at leat 2 years exp. Whatever you do don't bother with Miami. I'm here and I've been out looking for work anwhere and there is NOTHING. I've heard about some places in TX having new grad openings. I've been in the same boat for 9 months. I'm in Miami and it's REALLY bad here. I hope you can find something in tampa or perhaps central FLA. Good luck. I currently live in Miami and the job market is so saturated that it is almost impossible to find an RN job here without HR jerking you around and then telling you later that you need experience to get a job, which is the classic catch 22 when the job market is tight or nonexistant in an area. Anyway, My grandmother and aunt both live in (Near) Bismarck, ND and they've offered to put me up if I can actually get a job as an RN in a hospital or clinic. I've been out of school for about 9 months, but I do have my BSN degree and BLS, ACLS, PALS certifications and I have taken a Phlebotomy course to keep up my skills. Is there anyone who has knowledge of whether a move would be a good idea for me? I've looked at the web sites for Med Center One and St. Alexis but I really can't get a feel if I'd have a good shot at being hired. Any insight would be really welcomed. Thank so much in advance. Wow! That's terrible. I wish HR had gotten off there butts to help you. Hospitals just do not care about the well being of their employees. I wish you the best of luck from here on out. I agree this is really smart advice. Most likely this woman noticed someone else noticing a flaw and in nursing circles things can get around fast so don't let someone like that hurt your rep. Also, DO NOT take it personally. She's targeting your emotions and once she's done that, your responses will become predictable and easier to manipulate. Relocating to a new state to find a job... How to go about it? I didn't assume that the first poster was being sarcastic only blackcat99, and if she was just trying that's no problem. I thought she's read that I'd tried to looked for positions with degrees that are less pay than RN. My location has only 3 monopolies that run the health care here and their policy is that if you are an RN you CAN'T do anything else. I'd gladly work for free for the first 6 months just to get a foot in the door. If you only meant to help then don't worry about my last post. Gee thanks for the sarcasm. You're truely a good person. Why did I bother asking at all? 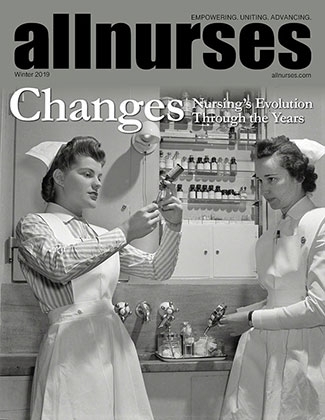 Do nurses really "eat their young?" Yeah, in school I had some nursing instructors try to eat me. They are the creeps. Just deal with them as best as you can. There are some perfectly ok nurses out there as well.